Strengths: Datsyuk is arguably the most talented playmaker in the NHL and has the qualities of a true Russian center forward – patience, passing ability, and discipline. He also excels in defense and penalty-killing, and doesn’t shy away from the physical game. Already a champion in both Russia and the NHL, Datsyuk has shown that he can be the go-to player on any team. Weaknesses: For the large amount of ice time he gets, Datsyuk doesn’t take as many shots as he could (averages 2-3 per game). Datsyuk’s scoring rate has also dropped in recent seasons. Biography: Like hockey players Alexei Yashin, Nikolai Khabibulin and Vladimir Malakhov, Pavel Datsyuk is from the Ural city of Ekaterinburg (formerly Sverdlovsk). Since his early childhood, Pavel learned hockey at the Yunost Sports School and was trained by Valeri Goloukhov. At the age of 18, he made it to the city’s Professional Hockey League team, Spartak (later renamed Dynamo-Energiya), and put up impressive numbers in his first year. When a leg injury halted his progress, Superleague team Ak Bars Kazan helped rehabilitate Pavel and he emerged as one of the best centres in Russia, helping his team make it to the playoff final series. He made his national team debut at the 2001 World Championship. Although he was drafted only in the 6th round in the NHL Entry Draft, the Detroit Red Wings could not wait any longer to have Datsyuk in their lineup, so he made his NHL debut in the same year. Datsyuk was incredibly fortunate to further develop his skills on a team with so many future hall-of-famers, including Steve Yzerman, Brett Hull, and fellow countrymates Igor Larionov and Sergei Fedorov. He joined Larionov and Fedorov in playing at the 2002 Olympics in Salt Lake City, where Russia won bronze. 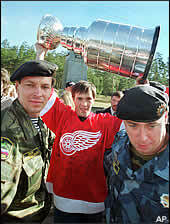 Also that year, the Wings won the Stanley Cup and Pavel brought the trophy to his hometown Ekaterinburg in August 2002, putting on a special celebration for the city. In the following seasons, Pavel’s role on the Red Wings dramatically increased with the departures of Larionov and Fedorov and the retirement of Yzerman. Pavel had to learn English and also added weight for increased strength, taking his game to a greater level. 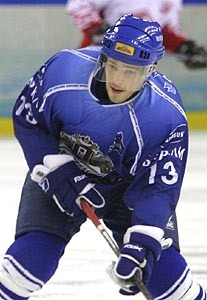 During the NHL lockout, he led Moscow Dynamo to the Russian Superleague championship. He was voted the MVP of the playoffs. Shortly afterwards, Datsyuk represented Russia at the 2005 World Championship and helped Russia win bronze. He was also Russia’s best player at the 2006 Olympics. Back in the NHL, Pavel became one of the NHL’s most consistent and highest scorers. Along with Swedish linemates Henrik Zetterberg and Tomas Holmstrom, Datsyuk formed one of hockey’s best lines. From 2006 to 2009, Pavel was annually recognized as the NHL’s most gentlemanly player (the Lady Byng Memorial Trophy). He is also a three-time Selke Trophy winner as the best defensive forward. In 2004 and 2008, he played in the NHL All-Star Game. In 2007-08, Pavel led the NHL in plus-minus and his Red Wings once again became the playoff champions, allowing Pavel to bring the Stanley Cup to Ekaterinburg for the second time. The following season, Datsyuk matched his career high in points, set a career high in goals, and was named to the Second NHL All-Star Team. However, Detroit failed to defend its Stanley Cup title and lost to the Pittsburgh Penguins in the 2009 final. Pavel played for Russia at the 2010 Olympics (losing in the quarterfinal) and the 2010 World Championship. At the latter tournament, Datsyuk joined the team late, but developed spectular chemistry playing on a line with Ilya Kovalchuk and Evgeni Malkin. Datsyuk scored six goals in six games, helping the team to a silver medal finish, and was named the tournament’s best forward. Immediately into the 2010-11 NHL season, Pavel quickly forfeited his candidacy for the Lady Byng Trophy by registering a “Gordie Howe hat-trick” – he scored a goal, an assist, and fought a player. Although he missed about two months due to injury in 2011, he is still arguably the best all-around hockey player and dethroned superstar Alexander Ovechkin as the recipient of the Kharlamov Trophy – given to the best Russian hockey player, as voted by fellow Russian NHLers. As Detroit was eliminated early in the 2012 playoffs, Pavel joined Russia to play at the World Championship in Stockholm and Helsinki. Pavel was the oldest player on the team, providing veteran leadership and world-class skills on a line with Alex Ovechkin and Alex Semin. Datsyuk registered 3 points in Russia’s gold-medal final victory – Pavel’s first. In September 2012, Datsyuk returned to Russia to play for CSKA during the NHL lockout.